The tiny, but dramatic island of Gasholmur off the coast of Vagar in the Faroe Islands. Have you considered a Faroe Islands holiday? 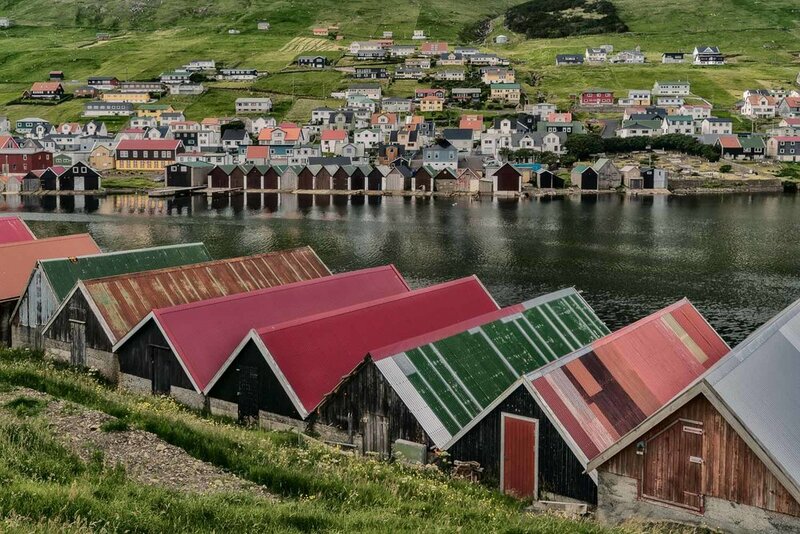 This remote, windswept and mountainous island group in the North Atlantic Ocean showcases dramatic scenery, picturesque villages and a Viking culture that can be traced back around 1,000 years. The above photo showcases the tiny, but dramatic island of Gasholmur off the coast of Vagar in the Faroe Islands. Getting to the Faroe Islands can be half the fun. There’s lots of interesting ways and, depending upon your timeframe, you could explore plane and ferry options as you assemble your Faroe Islands itinerary. What’s more, given the country’s location between Norway and Iceland, and its near proximity to Scotland, it’s easy to add one or all of those countries into a trip of four to six weeks duration. I arrived in the Faroe Islands exhausted. A late, final night in Copenhagen and a very early flight to the Faroe Islands airport on the island on Vagar meant I only had one hour in bed before starting this next leg of my journey. 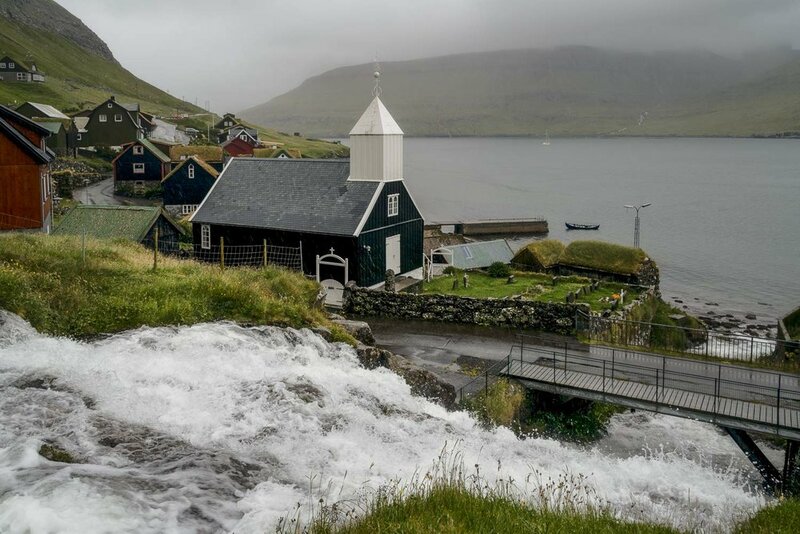 A waterfall cascades past a church and into the sea in the village of Bøur on Vagar, Faroe Islands. I got into my hire car at the airport and headed off on a very narrow road to begin exploring this wondrous country. After a short time I found myself in the interesting little village of Bøur and got busy making photos of some traditional Faroese houses and a small waterfall leading down to the sea. And then the rain came down. I continued to photograph and, after a while, headed off towards what I was told was a spectacular waterfall by the sea. The Faroe Islands could well be described as a far green country. But the beautiful and dramatic landscape comes at a cost. Faroe Islands weather is often wet and windy. A journey around the Faroe Islands involves quite a bit of driving and, in many ways, it doesn't matter which way you go. You'll get to where you need to go, eventually. It's just a matter of surrendering to the journey and letting the adventure unfold with every turn in the road. However, rather than backtracking to the main road, I decided to take a rather narrow, single lane road which climbed a cliff with a wonderful view of a few offshore islands. At that stage I didn’t know whether the road I was on continued back onto the main road or whether I’d have to, somehow, turn around and come back again. I really was exhausted and having to drive on, what for me is the opposite side of the road, was really doing my head in. But, it was good to be traveling and making photos. I reminded myself just how lucky I was, turned on the radio and started to relax. Suddenly my attention was drawn by a dramatic view of the islands offshore. A few seconds later I managed to clip the edge of the road. I had deliberately moved in that direction to avoid driving off the cliff on the other side of this very narrow, one lane road. What I didn’t realize was that the overgrown grass by the side of the road hid a narrow trench, no doubt designed to prevent water running down the mountain side and onto the road. The car came to a sudden stop and I was unable to extricate it from the ditch. The undercarriage of the car had bottomed out on the road and, not wanting to increase the likelihood of damage to the muffler and exhaust, I decided to sit it out and wait for help. The front door and black tar wall of a traditional turf roof house in the Faroe Islands. Fortunately, within a few minutes a local came up the lane on a quad bike. He tried to help out, without success. He then called a friend and, eventually, we managed to prop up and then rock the car enough to be able to get some traction and get it out of the ditch with no damage done. What a relief! Neither of these guys would take any money for their trouble. Two hundred meters further ahead the lane joined the main road and I continued onto the waterfall by the sea and the deserted village at the end of the road. I grabbed my camera gear and, while being harassed by arctic turns, took the short walk down to a view of the waterfall. On the way back to the car it started to rain again. I was so tired that I thought, rather than driving in such inclement weather it would be safer if I took a rest. It poured for several hours, but I’d fallen into a deep sleep after around 20 minutes. I headed back along the road past the airport and towards the capital Torshavn, where I arrived around 1 hour later. By the end of my time in the faroes I’d driven on most of the country's roads and was much more at ease with the narrow roads, Faroe Islands tunnels and driving on the right hand side of the road. The good news is that, since my initial visit, a lot of work has been done to erect barriers along roadsides to make driving around the Faroe Islands much safer. I think that’s great. I really hope to be able to include the Faroe Islands in my next trip to Europe. I’d love to include a week in the Faroes with several weeks in Norway and two weeks in Iceland. What an outstanding photography adventure that would be. How about you? Could you imagine yourself embarking on a vacation to the Faroe Islands?